Yesterday, Warner Bros. company announced the Middle-earth: Shadow of Mordor Season Pass. According to the preliminary information, it will cost $24.99/£19.99, depending on the region. - two new story quests: The Bright Lord (the gamers will try a role of a blacksmith named Celebrimbor who must conquer the Sauron’s forces) and Lord of the Hunt (the players will chase the Mordor’s wild animals and beasts). Moreover, the Middle-earth: Shadow of Mordor Season Pass will give access to all the planned add-ons and various additional updates (new runes, skins, features, etc.). Let us remind you that the upcoming project will hit current and next-gen consoles in North America on September 30th. Europe and all the PC owners will see this action-RPG at the beginning of October. 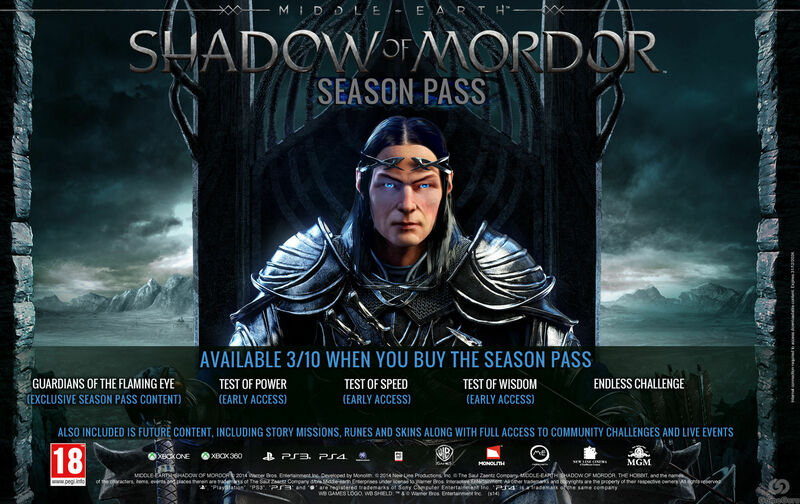 So, will you buy the Middle-earth: Shadow of Mordor Season Pass?